I don’t know about you, but I’d be LOST if it weren’t for meal planning. Now, that’s not to say that I do a meal prep every weekend because, let’s be honest, sometimes I don’t. But I always make time to plan our meals for the coming week. I like to use up what I have on hand first (again, budget + waste). And most of all, I like to have some modicum of predictability in my week. Meal planning let’s me accomplish all those things in about 15 minutes. And when I do have time to prep, well, that’s just icing on the cake. Even if it’s a super quick prep to knock out a big salad, wash and prep veggies for snacking and recipes and prepare a whole chicken to repurpose for other meals later in the week – it still gets me ahead for the week ahead and reduces the likelihood of not knowing the answer to ‘What’s for dinner?’ or having to scramble to put something on the table fast. 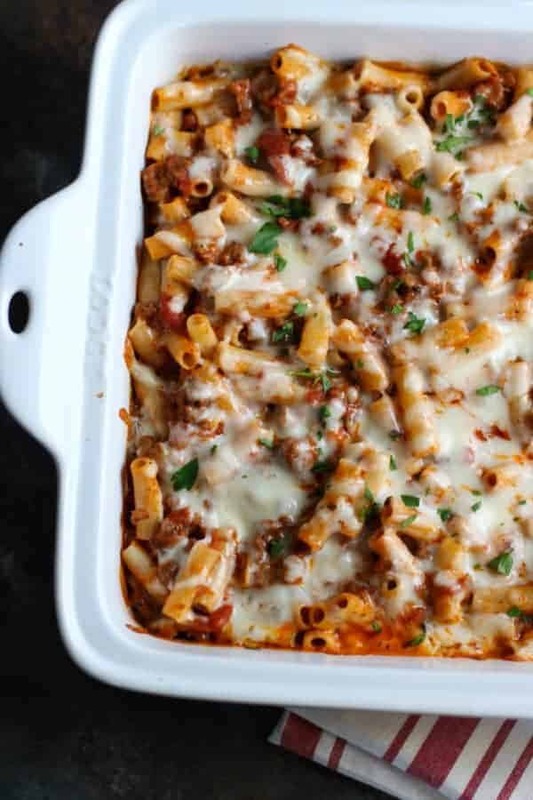 Which is why I’m sharing this 5-ingredient Baked Ziti recipe today. It’s a regular on our meal plan and something that I can prep ahead, stash in the fridge and pop in the oven when the week gets hectic – and I think you’ll like it, too! I mean, c’mon…what’s not to like? Just look at that easy, cheesy goodness. 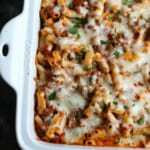 Yes, you can freeze this 5-ingrdient Baked Ziti to make life even easier later on down the road when you need a ‘reheat & eat’ meal. If you’re using gluten-free pasta like I do, you’ll want to cook the noodles until they’re just shy of al dente so that when the dish is thawed and baked the noodles won’t turn to mush. It’s best to thaw the dish overnight in the fridge then bake, covered with foil, at 400ºF for 35-40 minutes or until hot throughout then remove the foil for the last 5-10 minutes of baking to allow the cheese to get all melty and a little brown around the edges. You CAN make this dish from frozen, however, it will take significantly longer to bake (covered with foil) – plan for at least an hour or more in the oven at 400ºF. Looking for a meat-free option? 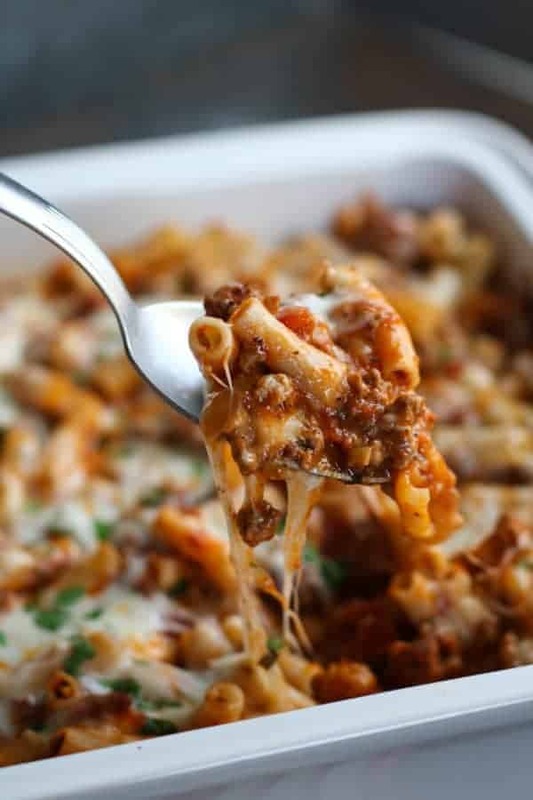 Just replace the ground beef and Italian sausage with 1-2 cups of your favorite cooked vegetables. I like sautéed zucchini, mushrooms and peppers but feel free to use that you have on hand. If using greens like spinach or kale, there’s no need to precook them – just stir them right into the pasta when you add the sauce and cheese. 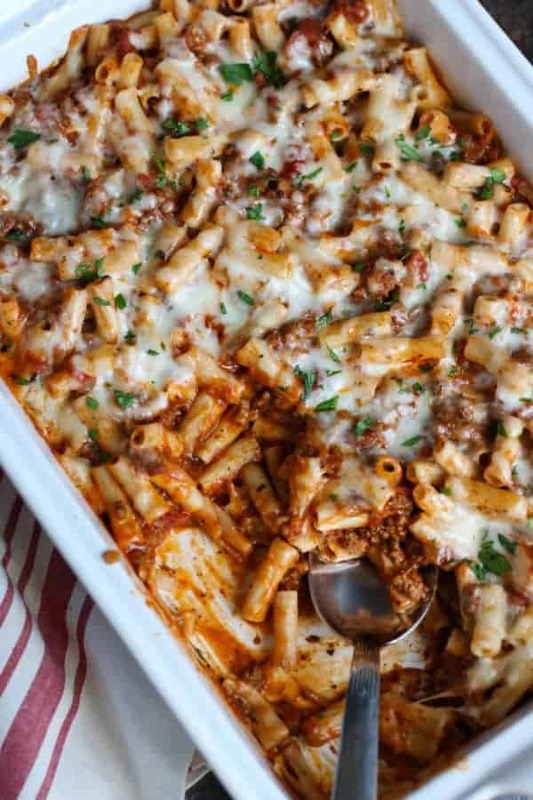 And take a load off knowing that this 5-ingredient Baked Ziti will be waiting in the fridge (or freezer!) when you need it this week. Preheat oven to 350°F. Grease a 9×13-inch baking dish and set aside. Add ground beef and sausage to a skillet or saute pan over medium high heat. Using a spatula, break up the meat so it cooks quickly and evenly. Add optional garlic and cook until meat is no longer pink. Drain fat from meat, if needed. Transfer meat mixture to a paper towel lined plate using a slotted spoon or spatula. While meat is cooking, bring a large pot of water to a rolling boil. 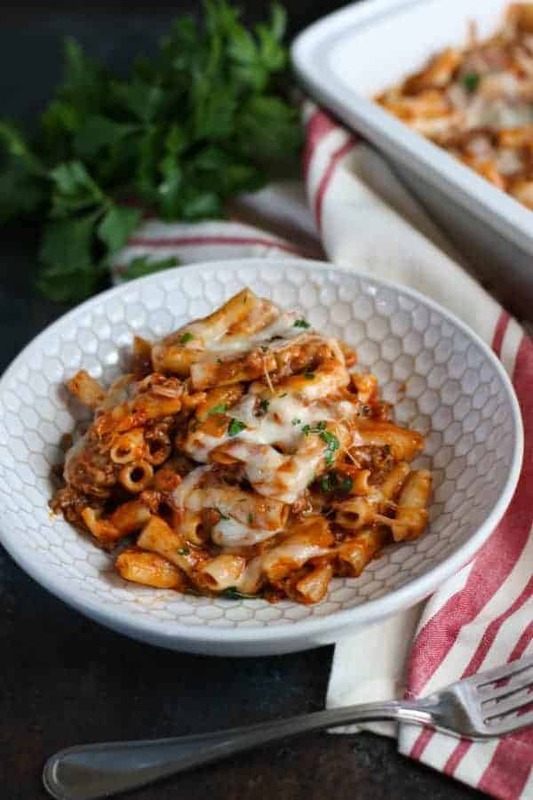 Add pasta and cook 10-11 minutes or until al dente (pasta should be slightly firm or it will become mushy when baked – and even a little more al dente if you plan to freeze it). Drain pasta and pour into the greased pan. Add meat, Italian seasoning, marinara sauce and ⅔ cup cheese to the pan with the noodles. Stir gently. Sprinkle with remaining ⅓ cup cheese. Cover pan with foil and bake for 30 minutes or until hot and bubbly. Remove foil for the last 10 minutes to allow cheese on top to melt. Sprinkle with fresh basil, if desired. To freeze, prepare up through Step 5. Cover pan tightly with foil and transfer to the freezer. Will keep frozen for up to 3 months. Thaw overnight in the fridge then bake, covered, at 400ºF for 35-45 minutes. To bake from frozen, bake at 400ºF for 60-75 minutes or until hot throughout. What’s your go-to, make-ahead weeknight dinner? Tell us in the comments below! Yum!! What are your favorite pasta brands and sauce? Hi Gina, I would have to say for Gluten-free pasta my favorite brands would be Barilla or Ancient Harvest. I have also tried Banza which is a pasta made from beans and it was good but didn’t hold up as well. For sauce I usually choose Muir Glen. Hope that helps! This looks delicious. Hw much Italian seasoning do you recommend? Step 5? I’m wondering (i) whether one could use cubes of chicken instead of the sausage and beef, and (ii) how one could convert this to a veg option e.g. use black beans and broccoli/cauliflower instead. Italian seasoning is mentioned in the directions but not the ingredient list. How much? And where does the optional garlic go? Thank you! 1 tsp. of Italian seasoning and you can add the garlic with the meat. What brand of gf pasta do you think freezes best? Hi Karen, I typically go with Barilla or Ancient Harvest Quinoa Pasta. DeBoles or Ronzoni would be a couple of other options for you. Hope that helps! Delicious! New family favorite…and so easy!